Shortbread is a wonderful thing. It is so full of butter and simply melts in your mouth. It is my all time favorite cookie at Christmas and a ‘must bake’ every year. This recipe is so easy, no cooling in the fridge, no rolling, no cutting. You just need to combine all the ingredients and pat into an ungreased baking pan. The hardest part is waiting for them to come out of the oven. The colored sugar gives these cookies the perfect festive look and they are immediately ready for the holidays. This shortbread is Barbara Bush’s recipe from the “White House Cookbook” and can be found online here at Bake Space along with some other delicious recipes. Preheat oven to 350º. Combine flour, baking powder and salt; set aside. Beat butter on med. speed 30 sec. Add powdered sugar. Beat ’til mixed. Beat in flour mixture. Press dough into an ungreased 8X8X2″ baking pan. Prick top of dough all over with fork. Sprinkle with granulated and/or colored sugar. Bake in preheated oven 25-30 min. or until top is lightly browned. Cool in pan on wire rack for 10 min. Invert shortbread top side up. Cut into 1″ squares while warm. Cool on wire rack. To Store: Layer between waxed paper in airtight container; cover. Store at room temperture for up to 3 days or freeze for up to 3 months. 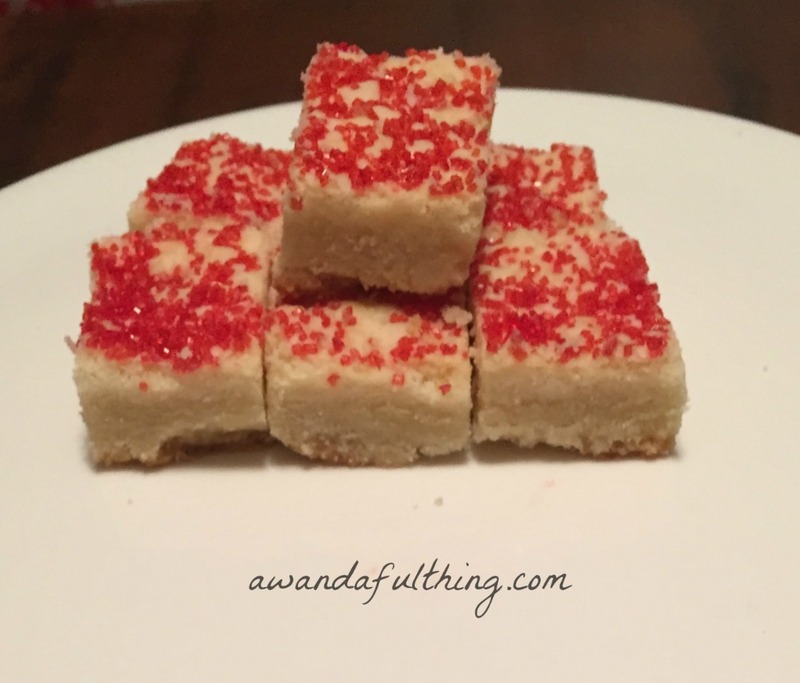 Day 9 – Christmas Shortbread Bars-It’s A Wandaful Thing! 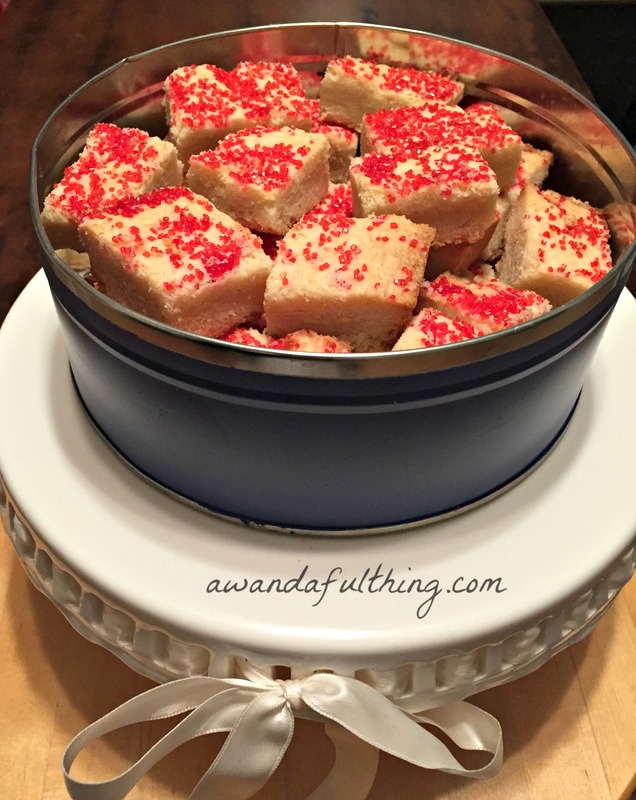 This entry was posted in DIY, Food, Make and tagged bake, bars, blue, butter, Christmas, colored sugar, cookies, DIY, easy, Food, make, melt in your mouth, red, shortbread, soft, Spray paint, vintage tin. Bookmark the permalink.